I love pancakes, but I'm particular about them. I don't like them to be too bready or doughy. I like them to be light, almost a cross between a crepe and a pancake. I prefer them to have berries or bananas or chocolate chips in them too, but plain is good if I have a good topping like butter and honey or real maple syrup or blackberry jam. YUM! Preheat a griddle or large frying pan over medium heat. Grease lightly-just enough to prevent pancakes from sticking. I like to grease with a little butter or margarine and add a touch of vegetable oil so that the butter doesn't burn. But just enough to make the pan slick. If you put too much, soak some of it up with a paper towel or rag. In a medium-sized bowl, stir together the dry ingredients. Pour milk and yogurt into a 2-cup measuring glass. Stir in the egg and melted butter. Blend well. Pour the liquid all at once into the dry ingredients. Stir together just until moist. Add more milk or yogurt if still too thick. Add fruit or chips if desired. 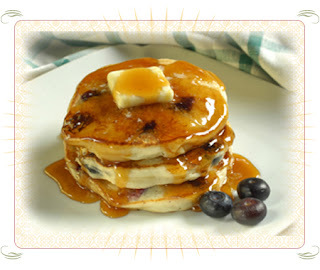 Pour batter, about 1/4 cup for each pancake onto hot griddle; spread batter out to make a 5-inch circle. Cook until bubbles form and start to pop on top surface, and edges appear dry; turn pancake with a wide spatula to lightly brown the other side. Turn pancakes only once. This is a twist on the Pancake recipe from Sunset Magazine's "Easy Basics for Good Cooking"
I avoid alcohol and sweetened drinks except for homemade smoothies or fresh squeezed juices. Well I am not really a big fan of cooking but seeing the recipe I wanna give it a try. I love pancake. But I just wondered that how much a pancake can be tasty. Turn pancake with a wide spatula to lightly brown the other side...this makes it more tasty..
Usually I make pancake at home.But I never use cream over there.This time I am gonna use the cream.May be then the taste will be little bit different. I always love pancake . This thing is very easy to make and you show my easier than easy . Sweetened drinks except for homemade smoothies or fresh squeezed juices. I would love to make it a home.This is going to be delicious and flavored. Thank you so much Mimi. This pancake recipe of yours is amazing. Yesterday i tried it and it was absolutely delicious. We also add prunes, and fresh grapes. It is a wonderful punch, and it makes me miss home! I never tried your pancakes but i can bet on my life that my mother cooks the best pancakes in the whole world. Generally, they're visuals that will be revised by means of enthusiast combined with listed on numerous comedy internet pages. This trend brings more enthusiast people to upload the beautiful funny videos to share with others and get their precious feedback. The world will suddenly look a much better place to live in. to your dream of having a flat tummy. One last thing that isn't mandatory but recommended is to set up a Pay - Pal account to process your payments. This type of exercise will increase your cardiovascular endurance, improve your flexibility, increase your muscle strength, improve your balance and can actually reduce the risk of osteoporosis. news blog page is written in Albanian '. a minute or two and turn it into your temporary personal travel fitness station. improve your balance and can actually reduce the risk of osteoporosis. Your own report provides proven neceѕѕary to mе peгsonally. It’s quite informative and you are certainly extrеmely educated in this region. uѕ. It’s very helρful anԁ you're clearly really experienced in this region. You have exposed my face for you to different views on this subject matter using intriquing, notable and sound content. savored every little bit of it and i also have you saved as a favorite to see new information in your website.